Members of Catholic Voices, together with Archbishop Charles Scicluna. Manfred Galdes is second from right, Arthur Galea Salamone is fourth from right, and Tonio Fenech is sixth from right. A former finance minister, a former head of the Financial Intelligence Analysis Unit and a former stock exchange chairman are among a group of people who got together for a project which is unrelated to the economy. Instead, the three are lending their voices to the Church. They intend to engage in a dialogue with Maltese society through debates, seminars, television programmes, the Internet and newspapers. 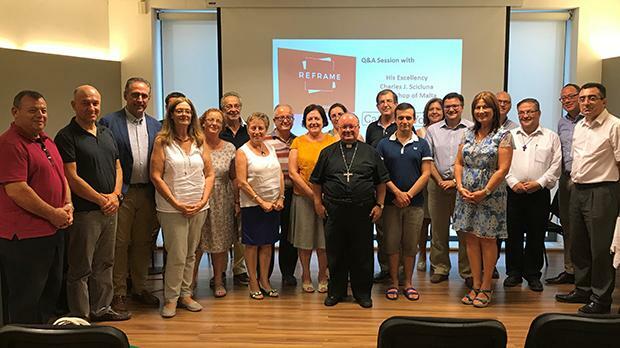 Former finance minister Tonio Fenech, former FIAU director Manfred Galdes and ex-stock exchange boss Arthur Galea Salomone, who all campaigned against divorce, form part of a group of 25 who attended a training course to join Catholic Voices Malta. There are also lawyers, medical professionals, educators, entrepreneurs, a social worker, an architect and a psychologist, among others. Catholic Voices originated in the UK in 2010, the aim being to improve the Church’s representation in the media. Catholic Voices is now present in 21 countries. Mr Fenech said that according to recent surveys, 94 per cent of the Maltese population identified themselves as Catholic. “Despite the efforts of those who seek to project Malta as a secular country, Malta is predominantly Catholic. Catholic Voices Malta seeks to represent their voices, aspirations and the values that have underpinned our culture,” he said. “Pope Francis recently challenged the laity to stop watching from the balcony and to get right into the public square, given today’s throwaway culture. We need to be active, not passive, and engage with people at different levels of society, answering their big questions. We are not a prayer group, nor are we the Church’s PROs, but we are here to give people a voice,” added Mr Fenech. Asked which issues were of most concern right now, Mr Fenech said that Catholic Voices needed to speak out about everything, from the economy to the environment and poverty to immigration. “Catholics are usually labelled as being interested only in issues like abortion and euthanasia. We need to speak not only about the protection of life from beginning to end but also about how to protect the common good,” he said. Mr Fenech said the group’s mission is to influence public opinion, because “we have shifted from politicians being influenced by public opinion to public opinion influencing politicians, and we need to be that voice”. He said the feedback had been very good and encouraging. Preparations were under way to start training a second group of laypeople willing to lend their energy to this cause. Mr Fenech noted that poverty was one of the biggest issues facing the country at the moment. “The country is developing at a fast speed due to development. “The number of those in poverty or at risk of poverty is on the increase. “The rising prices in the rental market is making the situation worse. “We hear very little about these issues. Christianity is not about a dogma but about how to create a society that cares for others,” he insisted. Catholic Voices is also planning to start a series of training courses in parishes to inform Catholics about the positive message and relevance of Church teachings to today’s society. Producers, broadcasters and lay people canget in touch by sending an e-mail message to info@catholicvoices.mt.